An amber coloured typical example of a Kellerbier; very full bodied and soft, low carbonation, beautiful hop aroma - but not a simple bitterness: highly quaffable! An excellent gaushaus.Usually full of local patrons.Friendly service,wonderful German food & bier.Beautifully decorated & clean,no tourists. Kraus Hirschen-Trunk has a lovely malty/smoky aroma and full amber color, a no-less-pleasantly smoky roasted malty flavor which - despite good hop balance - intensifies somewhat into the finish. Good full body. Kraus Helles Lagerbier also has a rich malty body gently balanced by hops as it eases into the finish, clean and smooth with a full malty nose and pale golden color. Kraus Hefeweizen has a pleasing clovery/yeasty nose and pale amber color typical of the style; strong yeasty + wheat flavor fairly overwhelms hop tones. Carbonation fades quickly from brew. The Gaststätte has a lovely rustic feel to it and is very inviting. Very much a place where locals gather to share stories and play cards. Owners were very friendly and hospitable, making the visit even more pleasant. Overall a very worthy destination; highly recommended. Well worth visiting. Good beer and a lovely beer garden at the back. A pretty extensive beer menu was available when we visited, 8 house beers were available in all, which is rare in the region. We had the Lagerbier, a classic hoppy and well-built ungespundetes lager, and the Hirschentrunk, a lightly-smoked beer which was indeed very subtle, while still being an entertaining quaff. The white asparagus in hollandaise sauce turned out to be white asparagus with butter, and the accompanying potatoes were standard quality. We lunched and drank in the nicely shaded biergarten behind the Gaststätte. Id go back if I were to pass through Hirschaid again. -A dancing, classy, grassy, herbal hops flavor and bitterness soothes the soul. -A clean and drinkable body enhances the sunny experience. -Bread, cereal sweetness, and herbal hop all invite further gulps. -A veil of foam almost shields the unfiltered dark gold. -Cereal freshness, and even caramel, drop the curtain. -Peachy sweetness and earthy, smoky toffee deliver a choice aroma. -There is scant foam over the copper/russet gown. -Wooden, earthy smoke reappears, well-mannered, in the svelte body. -A little too clean for my tastes in rauchbier, though the caramel maltiness is certainly appropriately built. Well worth the short train ride from bamberg, and short walk from the station the beer is typical franconian craft beer at its best,I found the local clientele very freindly to a "foriegn" visitor and stayed long enough to drink "genuk"? I met the Brau Miester. Don't let his 26 years fool you, he makes a very special blend of Bier. I drank the Hirchen Trunk and could not get enough of it. Stop by for a good meal and more. 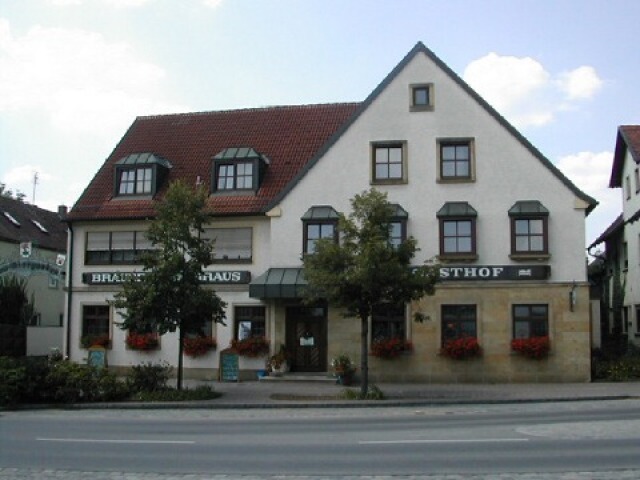 When you visit Brauerei Kraus in Hirschaid, about 10 km south of beermetropolian Bamberg, you feel at once the special atmosphere when you enter the Gasthof. You understand then how "Gemütlichkeit" is. The meal, beer, lemonade are created at the brewery. The brewer ist the son of the house, Georg Kraus (jr). Georg Kraus tap the beers, assisted by good looking Fraunleins. Hildegard Kraus rules with kindness and take care of the visitors, assisted by the daughter Stefanie. The ladies wears Trachtenkleidung and offer local and regional meals. The most drinking beer is Kraus Lager. The brewery produce also Pils, Hirschentrunk (smoked malt), Weissbier. If you get tired in midnight after meal and adventures, you have the possibility to hire a room. The Brauereigasthof have more than 50 beds. Many local visitors in all ages. The brewery lays close to the channel Main-Donau. The dorf Hirschaid is between Fränkische Schweiz and Steigerwald. Sampled Lager, Hirschentrunk & Pils: The lager is a well balanced, slightly malty and highly enjoyable beer. The Hirschentrunk... well, we expected more. We got an ordinary smoked beer, very hop pronounced. The real highlight was the Pils! In this area probably the best of it's type, even better than a Lieberth Pils of Hallerndorf. Hoppy of course, but also slightly metallic and old fashioned. Great beer. Rated, the Lager would be a "3.5", the Hirschentrunk a "2.5", the Pils definetely a "4.5". A lively and inviting pub/restuarant. My Lagerbier was delicious while the Festbier was simple and amber. But the lightly-smoked Hirschentruck was the highlight. Very enjoyable dinner. The lager had an unpleasant aftertaste but the tasty Hirschentrunk made the visit worthwhile. We've been lucky always to visit this Stube in lovely sunny weather, sitting in the fine beer garden to the rear. Enjoyed the beer 'Selbstbedienung' Bayern anstich. A pleasant but maybe unremarkable pils but an excellent Rauchbier - Hirschenhaustrunk. Not as smoky as Schlenkerla and not, perhaps, quite as well crafted as Spezial but, still, very drinkable. Visit in 2012 coincided with the town's 'Kanalfest', so had the pleasure of listening to the local brass band - a super day! Which number is highest 95 or 91?